Christmas baking (well, all Christmas cooking, if I’m honest) is my absolute happy place when it comes to being in the kitchen, which is saying something given I’m happy to be in the kitchen in general. A few weeks back I asked on Facebook whether there was any interest in me sharing a few favourite Christmas gift recipes, even though they aren’t steam oven ones. This panforte made with white chocolate, honey, ginger, apricots and nuts got quite a few questions, and lots of you could not say yes to the offer of extra Christmas recipes fast enough, which makes my baking heart so very pleased! It’s lovely knowing I have plenty of kindred spirits who also enjoy gifting homemade food at this time of year. Is it just me or are we a dying breed?! This recipe is one I’ve been baking for at least 15 years. It was based on something I tore out of a magazine (I’m not actually sure which one, the scrap of paper is long since lost), and I heavily adapted it to change the fruits and spices and add almonds to the cake. Each Christmas I gift it to a few new lucky people, but I always make sure I bake enough to keep the loyal fans from years previous in stock, or I might have a riot on my hands. 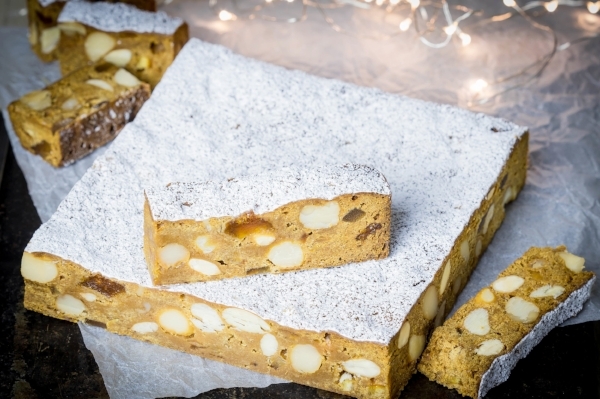 Panforte is Italian in origin, and the literal translation of the name is ‘strong bread’. I assume the strong part is a reference to its sturdiness rather than strength of flavour, but I may be wrong. It is indeed pretty sturdy stuff (if not bread as we know it), with plenty of nuts and dried or glace fruits, held together with a relatively small amount of batter, always containing honey, which acts to add a hit of spices and glue everything else together. Sometimes known as Siena cake for the city it hails from, there are as many variations of panforte as there are people who bake the stuff. I was told once that the more traditional ones are firmer and darker than mine, with the potential to keep for a year or more. This version, as well as a dark chocolate one I sometimes make, is heavy and dense but still slightly fudgy. It might not be the most traditional but it’s fantastic and keeps very well for a good few months, improving with age. I hope you’ll get a chance to try baking this for your Christmas table. I know some of the ingredients (especially the glace fruits) can be hard to source depending on what part of the world you’re in, so if you’re going to the trouble can I recommend that you make a double batch – one for you and one to gift. I do multiple batches most years, and I’ve learned a few things about packaging and shipping them in the time I’ve been doing it. Have a look at my gifting tips at the end of the recipe below. Happy Christmas baking, see you here again soon. Makes 1 x 22cm/9 inch round or 1 x 20cm/8 inch square cake. I’ve made this recipe in many different quantities and pan sizes, from the single large cake version listed below right up to batches of ten times that, baked into dozens of small cakes. Though you’ll need good arm muscles to mix larger batches, it’s a recipe that scales well. The flavour improves after baking and though you can eat it immediately, I think the best time to eat this is 2-3 weeks after it’s baked, when the spices and fruits have had a chance to settle and blend with one another. The cake will keep, well-wrapped in a cool dark place, for up to a few months. Take care not to overcook your panforte. The cake should be lightly golden all over but still quite soft to touch when it comes out of the oven. It will firm up as it cools, and even if you’ve been a bit cautious and under-baked it, it’ll just be a little more fudgy than normal. I promise no one will notice. You’ll see I’ve simply noted ‘chopped’ for the glace fruits below, without giving a guide to what sized pieces to aim for. It’s up to you – finely chopped fruit will give a finer texture, roughly chopped makes for a chunkier panforte. I like to chop the ginger and orange into roughly 6mm/¼ inch pieces so they distribute evenly through the batter, but I make the apricots/peaches about twice that size for a bit of textural interest. See the prep photos for an idea of what I mean. 1. Preheat oven to 150°C/300°F, fan forced (convection) setting. Grease a 22cm/9 inch round cake pan and line the base with baking paper. 2. Put the chocolate and honey in a pan over very low heat, stirring often, until the chocolate is melted and the mixture smooth. If your stove doesn’t go down to a very gentle low heat I’d recommend doing this step using a double boiler so you don’t burn the chocolate. 3. Combine the flour and spices in a bowl and whisk to combine. Add the fruits and nuts and give everything a stir to coat them in the flour. 4. Add the chocolate/honey mixture to the bowl and stir well. I find clean hands easiest for this as the mixture is very stiff. Make sure everything is evenly mixed and there are no lumps of flour remaining. 5. Scrape the mixture into the prepared cake pan and press out gently with your hands or the back of a spoon until it’s even. Bake until golden but soft, about 45 minutes. Let it cool slightly, then run a thin knife around the edge of the pan to loosen the sides. 6. Cool the panforte completely in the pan, then turn it out and wrap well in aluminium foil for storage. Keep in a cool dark place and when you’re ready to serve, dust it with powdered sugar and cut into thin wedges. I usually gift these in smaller, 10cm/4 inch rounds, or bars cut from a larger square cake (see main photos). They’re a great inclusion in a hamper of several different Christmas treats, though a whole large one would be a generous and special gift. Panforte ships well and can handle the temperature variations of most postal services quite comfortably. If you are gifting a single large panforte, I suggest you put it onto a cake round or a piece of card cut to size before wrapping, because they’re a little soft to transport otherwise. For gifting, dust the cake with a fairly generous layer of powdered sugar, then wrap in baking paper and brown paper tied with a pretty ribbon, or clear cello/plastic. If I’m shipping and it’ll be more than a couple of days before it reaches the recipient, I often try to track down some non-melt powdered sugar so the cake still looks gorgeous when the recipient unwraps it. Over to you – if you try this recipe I’d love to know about it! Please share your pictures with me on Facebook or tag them @steamandbake on Instagram. Would you like more Steam and Bake recipes? Join the mailing list – there’s no spam, just an email every now and then to tell you the latest. I love my subscribers and they’re always first to hear about what’s going on in the Steam and Bake world of cooking. If you’re after more delicious Christmas recipes, the Combi Steam Cooking at Christmas digital cookbook has plenty, or you can try the spiced fruit mince tarts recipe from the book right here on the site.